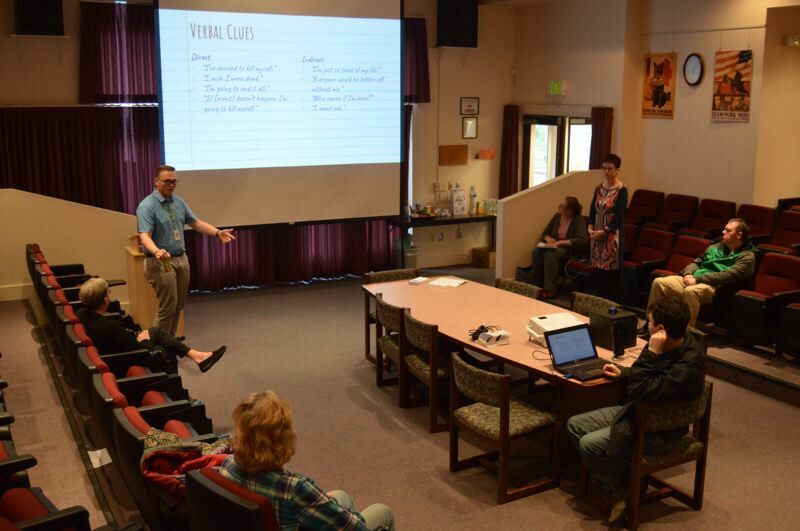 April is Sexual Assault Awareness month and Child Abuse Prevention month, and four different community agencies are partnering to present an educational series centered around the intersection of various community resources. SAFE of Columbia County and the Amani Center have been partnering together for three years to offer educational outreach during April. This year, the two agencies have expanded their scope to include Columbia Health Services and Columbia Community Mental Health. Each Tuesday of the month, a different workshop is being held at 5:45 p.m. at the Columbia Learning Center. The collaborative effort aims to highlight how the various organizations address needs that often overlap one another, Ellyn Bell, the Executive Director of SAFE, explained. "The biggest impetus to do this is to work as a community. Sometimes, even in small communities, you can kind of get away from that, and you can become siloed in your own work, so it's important to see how we overlap," Bell explained. By combining forces with multiple partner agencies, the month-long series, titled "Raising Community," can address a variety of topics, including sexual assault and abuse awareness, mental health connections, child abuse recognition and prevention, human trafficking, internet safety and victims' rights. Beth Pulito, the fundraising and outreach coordinator with the Amani Center, helped develop the idea after seeing how another partner agency in Umatilla developed a similar presentation series. She said the partnership also helps lighten the burden for each agency. "By being able to say we want to have a month-long event that brings awareness to all of our topics, it spreads the weight," Pulito said. "I would say that we're focusing on different things, but you can see that they all relate." Pulito added that the community connection is not only beneficial for the agencies involved, but also showcases how effective a collective effort can be in addressing an issue. "It's a community effort to do all this community education. Not one person, one family, one organization can make as much of an impact or shift as we can do together," Pulito said. During the first week of the series, organizers hosted a screening of the documentary "Audrie and Daisy," which follows the stories of two teen girls in different towns who were both sexually assaulted and then bullied through social media, leading both girls to attempt suicide. Bell said addressing the connection between mental health and abuse can be an important topic, one that is not always addressed. "Especially with a youth and sexual assault, if there's blame on the person who might be the accusing party, that can lead to a lot of isolation and despair and bullying," Bell said. "Bullying is one of those things that isolates youth and puts them at risk at self harm, whether that be suicide or cutting or any number of things, because they will often blame themselves for the abuse." On Tuesday night, Weston Perkins-Clark, a suicide prevention coordinator with Columbia Health Services, and JoAnn Dohn, a mental health counselor with Columbia Community Mental Health, spoke about recognizing signs of depression and suicide prevention. "All of us can be involved. The people we most need to reach are not the people I see everyday," Dohn said. "It's everybody else out there." The discussion also focused on how anyone can step in to start a caring conversation around mental health, using a method called QRP, which stands for question, persuade, refer. "Everybody has the capacity to learn to intervene in some way," Perkins-Clark said. St. Helens and Columbia County, it can bring about awareness. For organizers, the best measure of success for the event is to see people learning. "That's the main goal, is to educate and provide information and be responsive to the community's needs," Bell said. "So our measure of success would be that people, even if its only a few people, would have new tools and information and they can then share that with other people, too." Pulito echoed similar sentiments. The more information that can be shared about locally available resources, the better. "We want to be out there and be visible so people know where they can turn to," Pulito said. April 16: "Giving a Child a Voice." Topics include child abuse awareness, recognition and prevention. April 30: Film screening of "The Amendment," a movie focused on victims rights.